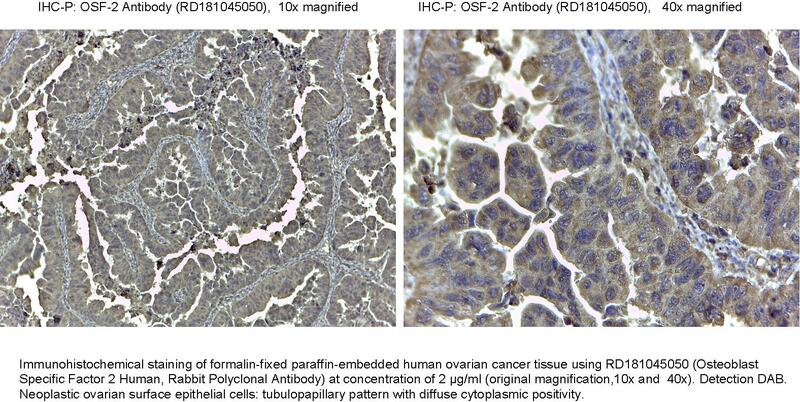 The antibody was raised in rabbits by immunization with the recombinant Human OSF-2. Chamberlain CS, Brounts SH, Sterken DG, Rolnick KI, Baer GS, Vanderby R. Gene profiling of the rat medial collateral ligament during early healing using microarray analysis. J Appl Physiol (1985). 2011;111(2):552-65. Erkan M, Kleeff J, Gorbachevski A, Reiser C, Mitkus T, Esposito I, Giese T, Büchler MW, Giese NA, Friess H. Periostin creates a tumor-supportive microenvironment in the pancreas by sustaining fibrogenic stellate cell activity. Sun GW, Li JS, TangWH. The Expression and Significance of Periostin in Human Gastric Carcinoma.